Kusal Mendis grabbed the spotlight in a run fest day at the Galle International Stadium. After a bright start, Bangladesh bowlers found it hard to keep the momentum. Earlier Rangana Herath won the toss and elected to bat first. 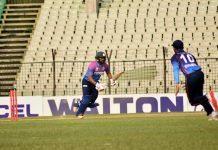 Subashis Roy struck on his very first over and dismissed Upul Tharanga on 4. Subasish could pick up the wicket of centurion Mendis in the next ball which was denied by overstepping. Before lunch break, spinner Mehedi Hasan Miraz gave the visitors another break-through. He got the wicket of Dimuth Karunaratne who scored 30. 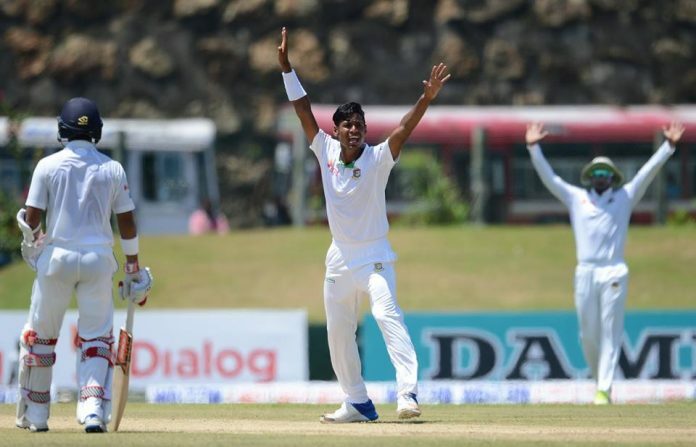 Mustafizur Rahman returned to the test cricket after 18 months and marked his presence with the wicket of Dinesh Chandimal. Next batsman Asela Gunaratne made a partnership of 196 runs with Kusal Mendis. Skipper Mushfiqur Rahim was searching for another wicket and used all of his bowlers including Mahmudullah and Soumya Sarkar to break the partnership. Finally Taskin Ahmed grabbed the wicket with the new ball. He dismissed Gunaratne for 85. Wicket-keeper Niroshan Dickwella passed the rest of the day without any trouble. He will resume the Sri Lanka innings with Kusal Mendis who is unbeaten on 166. Taskin Ahmed, Mustafizur Rahman, Subashis Roy and Mehedi Hasan shared one wicket each. Tomorrow Bangladesh will look forward to wrap up the Sri Lankan innings as early as possible.